I spent a fair amount of time over the weekend thinking about traditions. Specifically, I wondered what my own family’s traditions will be. 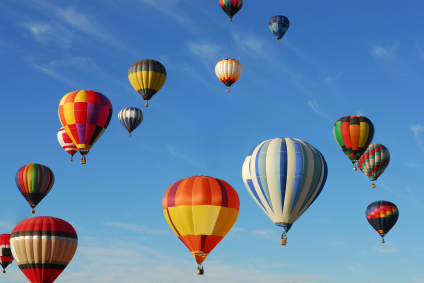 It was an assortment of hot air balloons that sent me on this mental tangent. Every year our city hosts a hot air balloon race. The race is always held on a Saturday. And on the night before they have what’s called the Balloon Glow. All of the balloons are inflated, but tethered to the ground. After the sun sets the inflated balloons synchronize their flames so that they all glow in unison. It’s really pretty amazing. Many families take blankets, camp chairs, picnic suppers, and make an evening of it. Even if we’d had the forethought to plan such an evening, IEP’s bedtime would have cut us short. But as I watched children running around, parents sitting back watching them, and a backdrop of glowing hot air balloons I thought ahead to next year. IEP will be nearly three and I wonder if we might be one of those families relaxed on blankets enjoying a perfect autumn evening. And I wonder if we’ll go every year; if the Balloon Glow will become one of our family’s traditions. I look back to my own childhood and think fondly of some of our traditions: Sour cream coffee cake and scrambled eggs on Christmas morning. Playing miniature golf during vacations to Colorado. “Going around the table” during dinner after church every Sunday and contributing our own responses to a common question. As I think about these things I’m struck by the fact that I have no idea how or why or when each one originated. I’m quite confident that my parents didn’t set out to make them traditions. They evolved organically – threads in the fabric of our family that emerged into a pattern over time. So, back to today, and back to my family. Here is my question: Must traditions evolved organically? Or can we be proactive about creating them? And if they come about on purpose, are they cheapened by that genesis in any way? I suppose, more than anything, I hope that my family has traditions. I hope that we will have quirks and idiosyncrasies that are enduring and beloved. I hope that our traditions are remembered affectionately by my children when they are grown. I imagine that every family has traditions of some kind, and that ours will be no exception. But we are still a young family and most (if not all) of our family traditions are still to be born. So I am left to wonder what they will be and where they will come from. My mind could go in a thousand directions with a topic like this. But I suspect I will be best serve by letting our traditions develop on their own. This post was originally published two years ago, and this weekend we will attend the Balloon Glow for the third time. I think, perhaps, it is becoming a tradition. At the very least, it’s something we look forward to and really enjoy. This entry was posted on Thursday, September 13th, 2012 at 5:00 am	and is filed under Family. You can follow any responses to this entry through the RSS 2.0 feed. Both comments and pings are currently closed. Cathy – You raise a good point, which is that we have to allow traditions to organically fade, just as they organically grow. When it becomes obligatory then it loses its purpose. I remember this post from when you first wrote it, and the issues you raise are as germane to me now as they were then. Since having kids, we’ve stumbled around, trying to figure out which traditions will become ours. It’s been challenging for us as an interfaith family to figure out what events are worthy of building meaning around. Like you and Cathy mentioned, the best ones are definitely those that have evolved naturally. The “Balloon Glow.” This sounds lovely. I think traditions evolve organically and with more deliberate intention. And they evolve, as children get older or other things reprioritize how we spend our time. I do wonder what my sons will remember – what, if anything, will feel “traditional” to them. Oddly, one which evolved has to do with balloons around the house, on special occasions. More than that? I guess I’ll have to wait a few years to hear. I genuinely don’t know. I remember lots of traditions that I held on to with my family growing up, but they haven’t quite made a transition to my adult family life. I would love to make to new traditions, but my husband doesn’t… and I’m finding that I’m falling into his apathy about traditions (sigh).